The only thing I hate worse than weeding is herbicides. I love my garden. I love the way it looks. I love the way it smells. I love the way it tastes. I love the idea of growing my own food. And of using something other than generic labor and water intensive ornamentals in the landscape. What I don’t love is the work it takes to keep my garden in magazine cover condition. So I don’t. I’m a lazy gardener and I take shortcuts. I plant most of my beds very intensively. 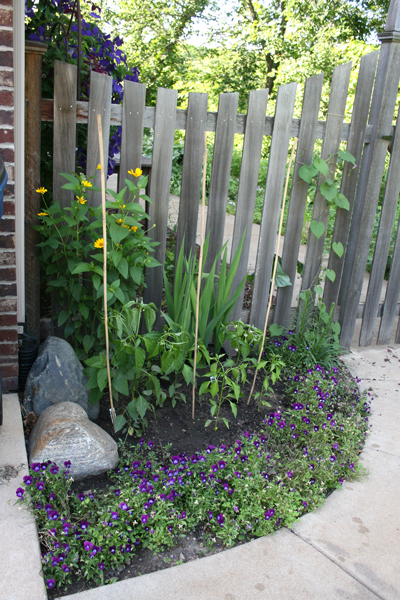 More plants means less space for weeds. I let spreading viny plants like pumpkins and other cucurbits take over much of the garden in late summer. They conveniently crowd out weeds when I get tired of pulling and hoeing them. I mulch. I do what I can to water plants directly instead of watering the whole garden (though in a place like Minnesota where we get regular rain I’m not sure this makes a real difference). I pull handfuls buckets of weeds and feed them to the chickens. But sometimes it makes more sense to call a freaking truce. So when this mullein plant sprouted in an out of the way corner of the rock garden I let it go. Baby mullein plants are fairly easy to control and the fragrant spikes of the mature plants provide a nice contrast to the pumpkin, tomato and lily plants in this area. I let wild field violets fill in the border next to the anchos. They crowd out just about everything else and contrast nicely with the oxeye sunflowers thriving next to the drain spout. Wild violets, being much more invasive, are not allowed to gain a foothold anywhere. Another common ‘weed’ I tolerate is purslane. Purslane, colloquially known as little hogweed, is an annual succulent that’s been grown as a leafy vegetable for centuries. Purslane doesn’t just add a hearty crunch to your salad – the leaves contain more omega 3 fatty acids than any other land plant. Add beneficial quantities vitamins A, C, B, magnesium, calcium, iron, potassium, cyanins and xanthins and you’re crazy to toss this pretty little invader in the compost heap. 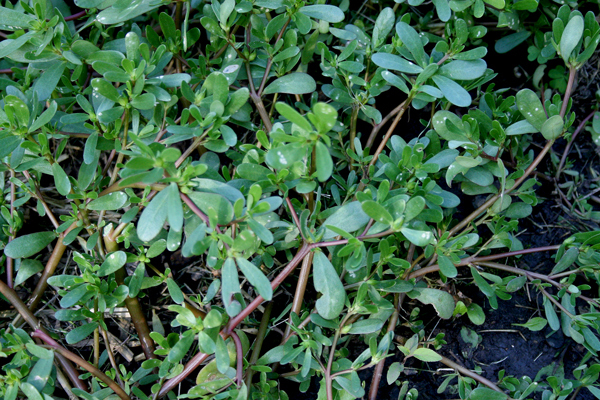 Purslane may be invasive but it’s shallow-rooted and requires little water or nutrients. Given its relatively innocuous nature there has been some interest in using it as a living mulch. Because I think the plant is both attractive and quite tasty I’ve decided to give the living mulch thing a shot. I’m going to experiment with letting it go in the places it sprouts to evaluate how good it is at crowding out other more problematic weeds. What does one do with a surfeit of purslane? 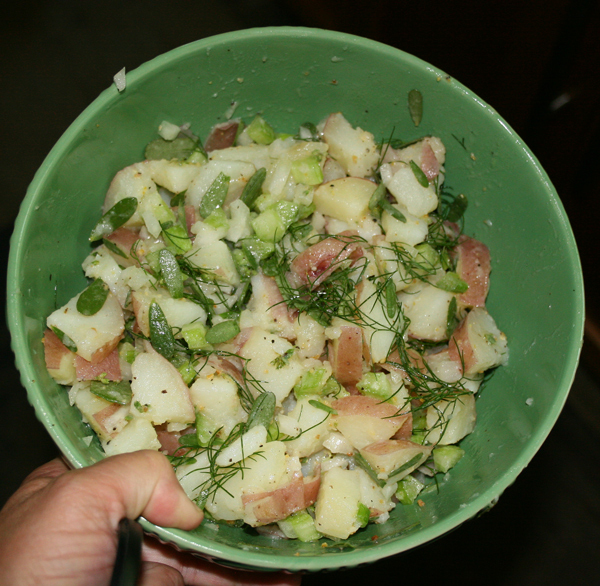 Today I made purslane potato salad. I took a dozen or so golfball-sized redskin potatoes, half a large sweet onion, 3/4 Cup of purslane leaves, 2 ribs of celery and a handful of fresh dill leaves and dressed them with a nice homemade lemon vinaigrette. It was delicious. And no, I’m not going to provide detailed directions. This is salad people, not rocket science! The stems and extra leaves were pureed with tomatoes (also from the garden) and added to tonight’s dog food. Nom nom!